The Rio Grande Railroad hub is found in Alamosa, Colorado. Since the establishment of Alamosa in 1878 the railroad has played an important role of transporting people and goods into and out of the San Luis Valley. The Rio Grande Railroad was completed on June 22, 1878. Not long after completion a train full of pre-built buildings arrived and where quickly assembled, this lead to the growth of Alamosa. During the late 1800s rail was quickly begin built in all directions from Alamosa. The railroad connected the towns of Creede, South Fork, Del Norte, and Monte Vista as well as to Salida and La Veta. With so many incoming and outgoing passenger and freight trains, Alamosa became the hub of narrow gauge railroading in America. It did not take long before the narrow gauge train track was being replaced with standard gauge. The difference between narrow and standard gauge train track is the distance between the two rails. Standard gauge is 4 feet 8 ½ inches while narrow gauge is only 3 feet or less. More than 100 years later, the same rails are still in use, carrying both freight and passengers over La Veta Pass. There are also trains that take passengers from Alamosa to Monte Vista and also from Alamosa to Antonito where they can ride the Cumbres & Toltec Scenic Railroad into New Mexico. Tell us which direction you left Alamosa. Did you enjoy your train ride? Share your experience here! Click on the following links to skip to that section! 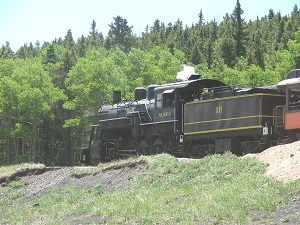 The Alamosa to La Veta train is the most popular and most frequently run on the Rio Grande Railroad. It runs most Fridays, Saturdays, and Sundays from May until October. There are several train departure times which you can choose from. There are also special events throughout the summer which have different train departures. If you like concerts then choose the train that takes you to Fir Station for a concert. Various artists perform during the summer but one of the best known is Michael Martin Murphey. Running on select Saturdays during the summer you will be treated to an elegant 3 course meal. The price of tickets varies for each event and also by which train car you want to ride in. To book an adventure on the Rio Grande Railroad and see a complete list of events and prices please visit their website at www.riograndescenicrailroad.com. As you can see the Rio Grande Railroad has a lot to offer through their different concerts, train cars, and special events. This is a great way to take a step back in time and explore Southern Colorado from a different perspective. What a fun ride this was! 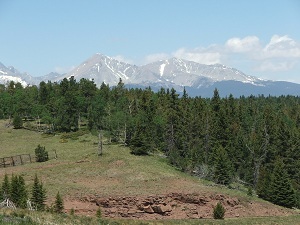 My Bible Study friends and I (Debbie) took this scenic trail ride to Fir (a stop between Alamosa and La Veta) where we enjoyed a Contemporary Christian Concert by Phil Stacey, who was an American Idol Season Six finalist. We boarded the train at 9:00 a.m. and enjoyed a scenic trip to the stop of Fir. While on the train, we were offered snacks and cold drinks to purchase. The train does stop in Fort Garland where we picked up a number of passengers who had come up from the New Mexico area of Questa and Taos. The time on the train from Alamosa to Fir was about 2 ½ hours which seemed like an ideal amount of time. On the ride we saw jackrabbits in the chico bushes, hawks overhead, and a cow elk and her calf. Once arriving at Fir, we de-boarded the train for the concert. 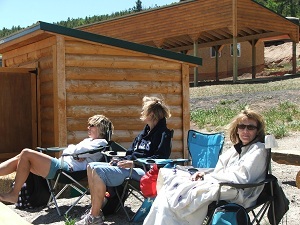 Others stayed on the train to head to the small town of La Veta to spend the afternoon. We enjoyed a great bar-b-que lunch provided by the Whistle Stop Bar-b-Que from La Veta. They served a roll, brisket or pork, beans, and potato salad. The meal was $12.00. We saw others who provided their own sack lunch. Be sure to bring sunscreen and bug spray as there is no covered area for the concert. 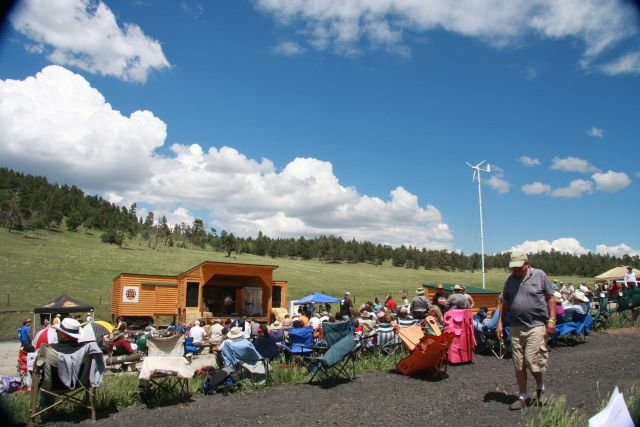 The concert setting was in a beautiful area surrounded by trees and mountains in the distance covered with snow. We took our own folding chairs but there are wooden benches available. The concert acoustics were wonderful. 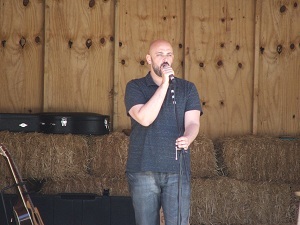 The concert began at noon with Fred Hargrove entertaining the audience with his music. He was followed by more entertainment by Barry Ward. Both gentlemen were very entertaining. Phil Stacey then began his concert. What an entertaining young man. We thoroughly enjoyed his music and testimonies. There was a brief intermission for use of the port-a-potties. Following the intermission, Mr. Hargrove recited a poem he had written. Mr. Ward then entertained us with his guitar skills and singing voice. Mr. Stacey then completed the concert. The whole concert time was about three hours. 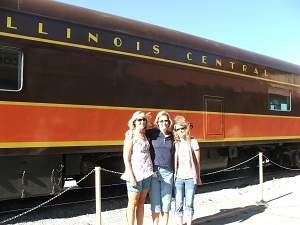 We then boarded the train to Alamosa. We enjoyed visiting with a young couple and their daughter on the ride back that had spent the day in La Veta. We de-boarded in Alamosa about 5:45 p.m. so it was a full day. Overall, the train ride and concert was wonderful. The length of the train ride was just right and the concert was great. I hope you take the time to ride the Rio Grande Railroad to Fir and enjoy a concert. Do you love riding trains? 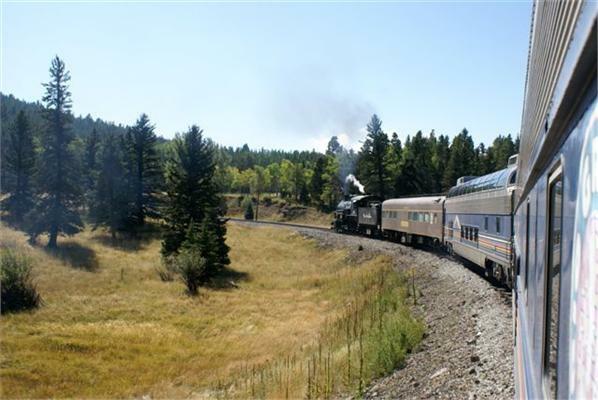 Then you do not want to miss riding the Cumbres & Toltec Scenic Railroad from Antonito, Colorado to Chama, New Mexico. But, what better way to get to Antonito than by riding another train. While it is only a short half hour car ride the train offers a more relaxing pace and a chance to enjoy the scenery. The train is only scheduled to run from June 15th-August 17th for 2011 and only on Wednesdays. It will depart Alamosa at 8:45 am and 2:45 pm. 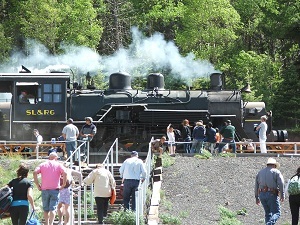 This is a unique experience as this is one of the few remaining standard to narrow gauge connections. This train is meant to be a round-trip experience where you leave Alamosa in the morning and return later that evening, but this includes taking the shorter train ride on the Cumbres & Toltec. If you wish to take the Cumbres & Toltec all the way to Chama, New Mexico than the ride is only one-way and you must find your own transportation back to Alamosa. Want to take a shorter train ride? Than this is the train for you. While it only travels one day a week it is sure to be a great time. The 2011 Rio Grande Railroad schedule to Monte Vista will depart from Alamosa at 10 am and 2:15 pm from June 16th through August 18th. As you travel from Alamosa to Monte Vista you will pass some of the farmland. Farming is the driving economy in the San Luis Valley. Once in Monte Vista you have an hour and a half to look around. The train depot is just a few blocks from the main street where you can find places to eat as well as shops to look around in. There is also a park if you prefer to just relax. 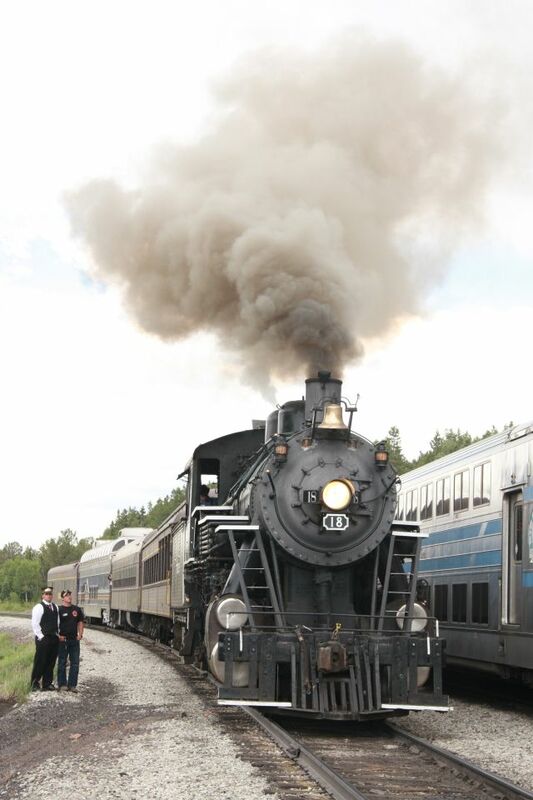 A ride on the Rio Grande Railroad or any train for that matter allows you to take a step back in time and relax. Without the pressure of driving you can enjoy the scenery, look for wild animals, or heck take a nap! We hope you enjoy riding the Rio Grande Railroad, whichever direction you may choose to go!